The mental health division of an NHS Foundation Trust were looking for a substantial solution to provide discreet assessment areas for patients. The requirement was for confidential meeting spaces that offered good sound suppression and conversation privacy levels but that were cost effective and were portable. The trust were facing a big challenge to accomplish this in the time needed and a visit to the AcousticPods.co.uk showroom really helped advance the process. The NHS project team were able to view our scope of products and manufacturing techniques whilst our experts developed suggestions that helped create the best way forward. We considered the need for disabled access to the acoustic pods, efficient lighting, speech privacy calculations and air circulation requirements. Our on-site acoustician explained the principles of sound absorption, sound blocking and sound masking which focused the team on their specific targets for speech privacy levels coupled with the need for speech clarity within the pods. The discussions proved fruitful and 3 meeting pods were commissioned for manufacture with an installation programme within 4 weeks. 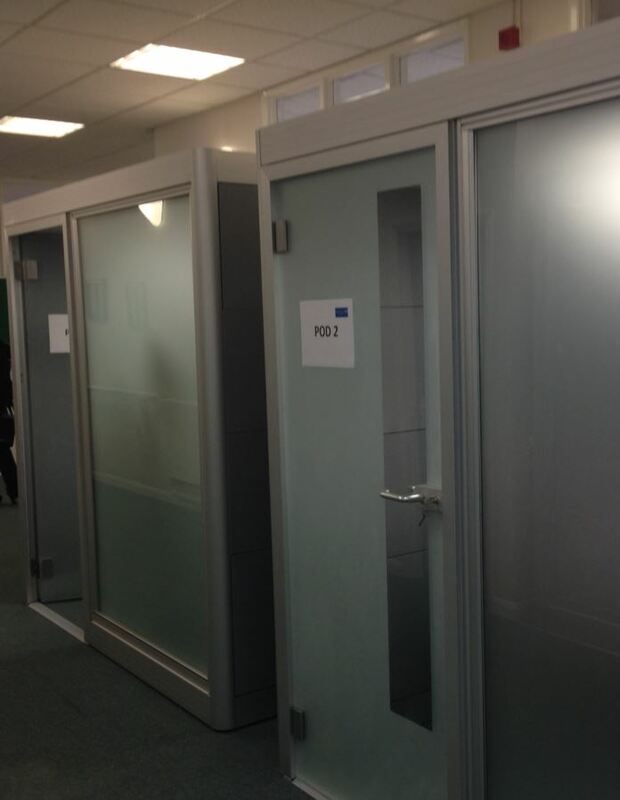 The NHS team were delighted when the pods arrived and were installed by our specialist fitters. The pods provided free standing, acoustic areas for private meetings that successfully muffle the conversations within and improve the clarity of speech for those using the pods. Importantly the pods are moveable and provide complete flexibility for future needs within the section.